Calling all flora enthusiasts to Nob Hill Nature Park. The Native Plant Society of Oregon and Friends of Nob Hill Nature Park will be hosting a guided walk through the 6.6-acre park from 1 to 3 p.m. Saturday, April 13. The annual springtime event is in its fifth year, and members of the volunteer-based Friends of Nob Hill Nature Park and the plant society, which co-host the walk, invite anyone with an interest in learning more about native plant species to attend. Flowers in the park are in bloom this time of year and provide ample opportunity for viewing, Caroline Skinner, a member of the friends group and the native plant society, explained. "Last year we were a little too early. We went in late March and there was not much blooming, but right now is gonna be a really nice walk," Skinner said. "We have trillium, fawn lily and checker lily. We'll probably see some of those little yellow violets in the lowlying areas and possibly some other interesting native flowers." Additionally, visitors can enjoy seeing an abundance of Mahonia aquifolium, commonly called Oregon grape, which is the official state flower, she said. "It's got bright, glassy, dark green leaves, and gorgeous yellow flowers, and it's in abundance right now," Skinner said. The walk is intended to be a casual stroll through the gravel-covered trails, lasting about two hours. Howard Blumenthal, another park volunteer, said the pace ebbs and flows depending on the interest of park visitors. "Sometimes people start pulling out books and magnifying glasses and start taking photos, so you don't know how long it'll be," Blumenthal said. Blumenthal said he is looking forward to spending time in the park and exploring for new wildflowers, some of which can be hard to spot due to their coloration, like the checker lily, which has a brownish-hue. "It's something you really have to get your eyes looking for to see it against the backdrop," Blumenthal said. Springtime is always a busy time for the park. Last weekend, on Saturday, April 6, a group of 13 volunteers assisted the Friends of Nob Hill Nature Park with one of the group's semi-annual park clean-up events. 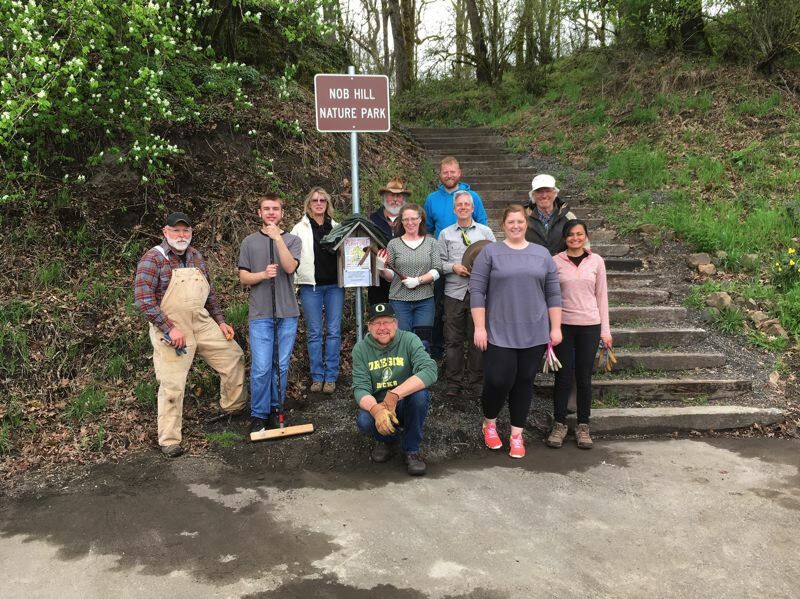 Volunteers helped work on the lower half of the park, pulling out an invasive species, and also helped plant two dozen native plants donated by the Scappoose Bay Watershed Council. The native plants keep invasive blackberry bushes in control and stabilize the slope of the park, Skinner explained. The volunteer group was also able to utilize two new cane cutters to remove blackberry plants. To find the park from Highway 30, turn onto Gable Road and bear right onto Plymouth Street. A parking lot at the city of St. Helens' wastewater treatment facility is on the right. Entrance to Nob Hill Nature Park is on the north side of the street.